Today’s theme is TWO-STATE SOLUTION, as indicated at 39a. 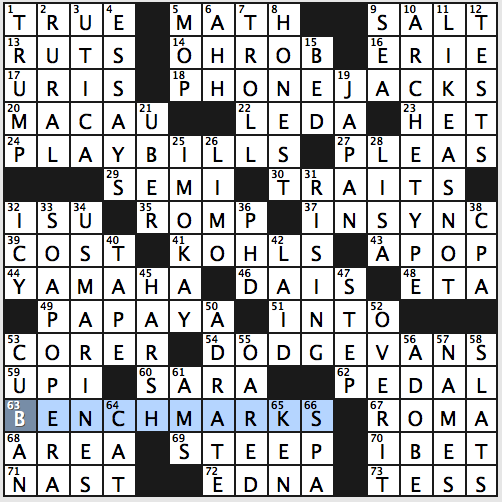 [Topic of international negotiations … and a hint to every four-letter answer in this puzzle]. Each of the four-letter entries are composed of the postal abbreviation of two states. For example, 6a. MISC is formed from the postal abbreviations of Michigan and South Carolina. There are 18 such entries in this 15×16 grid, comprising a lot of theme material. I had no clue was what going on with the four-letter entries until I got the revealer, which came towards the end of the puzzle for me. It took so long for me to get there, though, that it felt more like an “OH, OK” moment than an “aha!” moment. The theme entries were fine words for the most part, but a lot of the grid played harder than a regular Wednesday and took me about 50% longer than usual. Unknown to me were: SERIO, AMGEN, TRIAMORY, NOREEN Corcoran, AAU, Jean-Paul RAMPAL, CLAVE, ALAIN Delon, UDO, MAE Whitman, and the correct spelling of SHILLELAGH. (Known to me but less than ideal are the partials A FARM and A HOST. With such a long slog through unfamiliar territory, the theme would have to be incredible to redeem the puzzle for me. I did enjoy INGLORIOUS, MOO COW, and 4a. [Court tie-ups?] as the clue for SNEAKERS. Nice puzzle today from Burnardo (or should that be Burn & Gag? Nah. Let’s stick with Burnardo). Our theme takes common compound words or phrases that end in what could be a person’s name and repurposes them with the first part becoming a verb. 18a. [Call Nicklaus and Nicholson?] PHONE JACKS. I love the similarity of Nicklaus and Nicholson, and at first I thought that was part of the theme. But this is the only one like that. 24a. [Put Gates and Clinton in the game?] PLAYBILLS. Fine. 54a. [Avoid Heflin and Morrison?] DODGE VANS. Grumble. Not nearly as strong a phrase as the others. There’s the Dodge Caravan, the Dodge Grand Caravan, and the Dodge Ram Van, but how many people lump them together to say DODGE VANS? 63a. [Sit McGwire and Teixeira?] BENCHMARKS. Far and away the best theme entry, because the action in the entry is related to the people (baseball players). To be honest, I’m not sure why all the theme entries have to be plural. There’s nothing about the theme (other than the puzzle’s title) that requires multiple people. Moving away from the theme we get great long Downs in the NE and SW corners: ARCHETYPE, LIKE AS NOT, SOAP OPERA, and U.S. MARINES. Other fun shorter entries are YAMAHA, JAPAN, PAPAYA, TROLL, OVER IT, and I’M OKAY. Less-than-great fill includes ISU, LEDA, AMS, and HET, but they didn’t really detract from the overall solidity of the puzzle. 19d. [Country governed by its diet] refers to the National Diet, JAPAN‘s bicameral legislature (although JAPAN is well-known for its food as well). 53a. [Apple gadget] got me. I even put in an I at the beginning of the entry. Took me a while to see CORER. 68a. [Plane figure] is referring to a geometric plane, thus the answer is AREA. 50d. [Classified info] got me thinking of Clinton emails. Instead, the answer is AD RATE. Solid puzzle, though the theme entries were hit-or-miss. One missed, one homered, and the other two were solid base hits, so all-in-all, a good at-bat. Good afternoon, everybody! Ade here pinch-blogging for Ben today, and boy did I pick a doozy of a puzzle to talk about. The grid was created by the extremely talented – and equally as diabolical (in a good way) – Byron Walden. In the grid, each of the four theme answers had the consecutive letters “ZIG” and “ZAG” in it, and the grid boxes literally do a zig (or zag) in the areas where those letters belong. Oh, and each of the four theme entries go in opposite directions – top to bottom, bottom to top, left to right and right to left. The cluing was hard enough to try and get the theme entries without the rebus! Definitely a work out for sure! But workouts are fun, and this was fun. Also, I hope you guys can see this grid without any issues, especially since there was no .PUZ format available to subscribers. My apologies if you’re not able to make the letters out, but I tried (as always) to be as neat as possible. 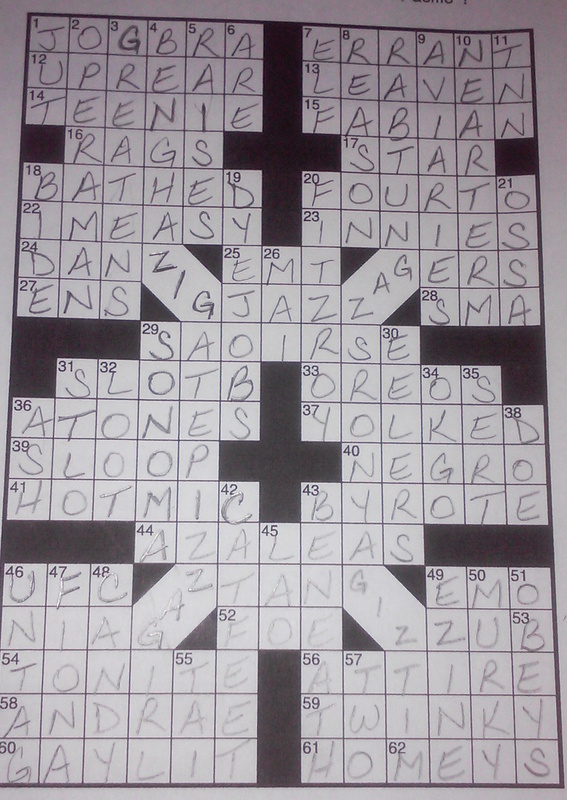 Obviously, I was not going to do this in pen, even though the letters would have been easier to read on here. Definitely knew that the letter Z was playing big in almost each of the theme entries, as I figured that “Benghazi,” “pizza,” “Ignatz,” and “jazz age” all had to be part of the theme entries, but wasn’t sure at all how they were being manipulated. What let me into the gimmick were the crossings in the middle-left portion of the grid, with ATONES (36A: [Does penance]), SLOOP (39A: [John B, for one]) and HOT MIC, something I’ve been a victim of talking into when not knowing I’m not the air, all allowed me to realize where the “pizza” part in the “Benghazigate Pizza Girl” was supposed to go (41A: [Gaffe conduit, often]). Then I thought that particular intersection/slant might be where the end to “Ignatz” would be (which it was), and it was all-go from there. Of course, this was after almost 20 minutes of being utterly frustrated as to not knowing what was going on. 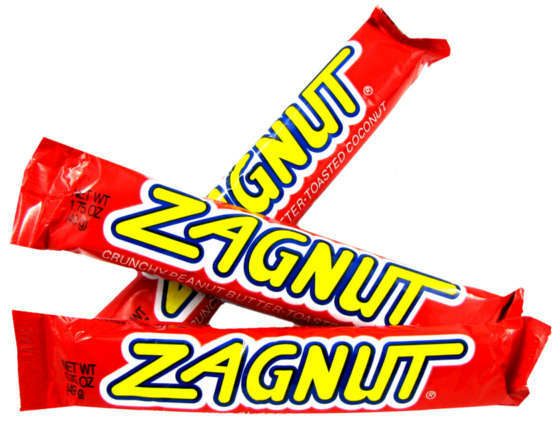 Only entry I really needed help from the crosses was the one involving Mitzi Gaynor, as I’m sure enough of you had a) heard of Mitzi Gaynor before, and b) heard of a Zagnut bar and knew what its signature wrapper looked like. Was 0-for-2 on those. I might have heard of JOG BRA once before today, of course in reference to sports bras, but I definitely loved the clue and the origin of that particular apparel (1A: [Original brand name for a sportswear item created from a pair of jockstraps]). So, in a way, there are two different clues/entries that refer to Carl Sandburg, if you look at the “John B” reference in SLOOP through the lens of his (Sandburg’s) folk songs collection. The other was CAT FEET, which took me a while to see since I lazily put an “S” at the end of that entry when first realizing it was going to be a plural (42D: [Stealthy movers in Carl Sandburg’s “Fog”]). Can’t tell you the last time I saw TWINKY, either in a grid or reading a comic strip (59A: [What Moe calls Calvin in “Calvin and Hobbes.”]). Grid played to a slightly older audience with the clues, which I’m sure pleased many on here. Grid pleased me too, but it was a fight to finish…literally. Last entry filled in? SAOIRSE (29A: [Oscar-nominated “Brooklyn” actress Ronan]). Heard the name before, had NO IDEA how to spell it! “Sports will make you smarter” moment of the day: RAGS (16A: [Spring cleaning needs]) – Former Major League Baseball pitcher and two-time All-Star Dave Righetti, nicknamed “RAGS,” was the key figure in one of the most memorable moments in baseball history almost 33 years to the day. On the Fourth of July in 1983, Righetti threw a no-hitter for the New York Yankees at Yankee Stadium against the Boston Red Sox, striking out Wade Boggs to complete the no-no. Rags is now the pitching coach of the San Francisco Giants, where he’s won three World Series titles with the Giants – in 2010, 2012, and 2014. See you later on today with the CrosSynergy/Washington Post writeup! Today we have a synonym theme. 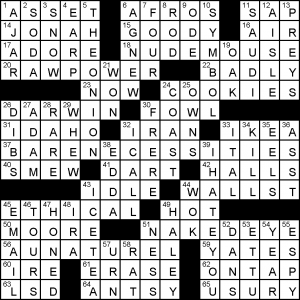 Four theme answers begin with synonyms for AUNATUREL: NUDEMOUSE, RAWPOWER, BARENECESSITIES and NAKEDEYE. The synonyms in use don’t stray too far from their AUNATUREL meanings, but I don’t think that they could. Not a whole lot more to remark on. [Site of the first “Occupy” protest: Abbr], WALLST is clunky. [Satirical publication that claims to be “America’s Finest News Source”], THEONION is probably the best answer in the grid. Its symmetrical partner is IHATEYOU is rather dark. Most of the rest of the answers are short and of one word. Fairly clean, but quiet grid. This entry was posted in Daily Puzzles and tagged Burnardo, Byron Walden, C.C. Burnikel, David Woolf, Don Gagliardo, Vasu Seralathan. Bookmark the permalink. 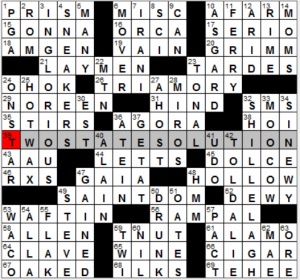 NYT: The word SOLUTION was misleading to me… I interpreted the revealer to mean that there were two different ways to solve, or two states possible for each of the 4 letter words. So, I actually tried to see if I could come up with an alternate solution. This was made worse because there were 2 stacks of 4 letter words top and bottom. I felt that made it even more Thursday-like. Obviously, that got me nowhere. When I realized that this was the wrong interpretation, I too had the OH OK feeling. There were Natick opportunities galore. The closest I’ve come to SHILLELAGH is Donna Shelala.But I did know ALAIN Delon and one of our trainees works at AMGEN. And TRIAMORY is an interesting word, which I deduced under duress. 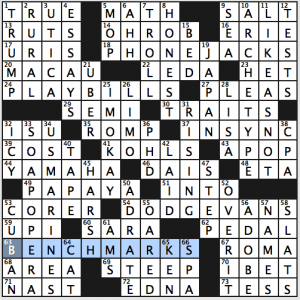 NYT – I liked the aha moment when I went back to single out all the four-letter answers. Quite a clever gimmick, IMHO. I could forgive the TRIAMORY! The crossing of the clue [Like an environment that’s difficult for farming] with the weird partial A FARM surprised me (not in a good way). We’ve talked about the avoidance of repetition of “high value” words and I wonder if others would buy the farm as one of those words? [Like an environment unsuited for agriculture]? Too many non-interesting obscure references to make this enjoyable. The theme was a bit cheesy as well. PGA strikes me as an inaccurate answer for the NYT’s 1d [Green jacket org.] since the clue refers to the Masters golf tournament, which is conducted by Augusta National Golf Club not the PGA Tour. Nice catch, Jeff. It reminds me that the USGA is not the PGA Tour either. The USGA is the rule-making body, along with the Royal and Ancient in England. If you saw some of the tweets and other posts related to the bogus penalty stroke assessed to Dustin Johnson in the U.S. Open, you would get a sense of the tension between the USGA and the PGA Tour. By the way, there are the PGA Tour (touring pros) and the PGA of America (club pros). The Masters is its own entity as was evidenced in the flap over female members some years ago. I thought this was a clever gimmick, but too tough a puzzle for a Wednesday. The Masters is part of the PGA Tour. The issue was not whether or not it was part of the PGA Tour. It was whether it awarded the green jacket. The Masters awards the green jacket, not the PGA Tour. Wait, there’s another Jeff K? Rare to encounter one in the wild. Greetings! I didn’t care for this one. Too many strange names and dodgy words. I agree with Jeff K that 1D is wrong — the Masters is a PGA-sanctioned event (and is also sanctioned by the European and Japanese golf associations), but the PGA doesn’t award the green jacket. Can we please please pretty please get rid of IRANI? No one says that outside of crosswords. Last but not least — what the heck is a TWOSTATESOLUTION? I’ve never heard of the phrase. Uhm, the whole Palestine–Israel issue? The two state solution is one of the long standing (but seemingly intractable) proposals for resolving the Israel Palestine conflict. Oh, I see. I took the clue to refer to some sort of generic international negotiation, as if “two state solution” were a kind of binational treaty applicable to many situations. Embarrassing fill needed to support a blah concept. I thought thIs was terrible, a slog, unenjoyable, etc. And I’m new to this so I tend to like a lot more puzzles than most of the bloggers. My only positive takeaway is that I do appreciate now knowing how to spell SHILLELAGH. I know I am showing my age, but I learned how to spell SHILLELAGH by playing Beyond Zork years ago. AV Club: 3D was ugly & 29A was just plain cruel, but what a great puzzle! What an awesome AVCX from Byron! 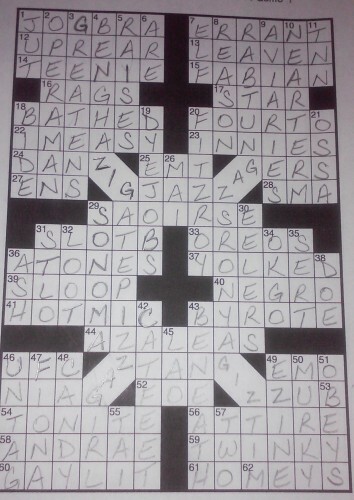 I loved it, and will be saving this one on my cork board of crossword masterpieces. It would have made a great ACPT #5. Norm – I didn’t mind GREATENS. I can just hear Donald Trump say something about regreatening America. Banal theme does not come close to offsetting the dreadful fill. The fill is mostly stale crosswordese shoveled over obscure and boring names and terms. Typical answers: CLAVE, TWI, ALLA, ASGARD, GAIA, UDO, RXS, TEHEE, NOREEN, HMM, RAMPAL, MIROS etc. NYT has hit rock bottom. I don’t think it can get any worse. Finally finished the AV puzzle. Wow. What a treat. This puzzle will likely generate a lot of Orca buzz. 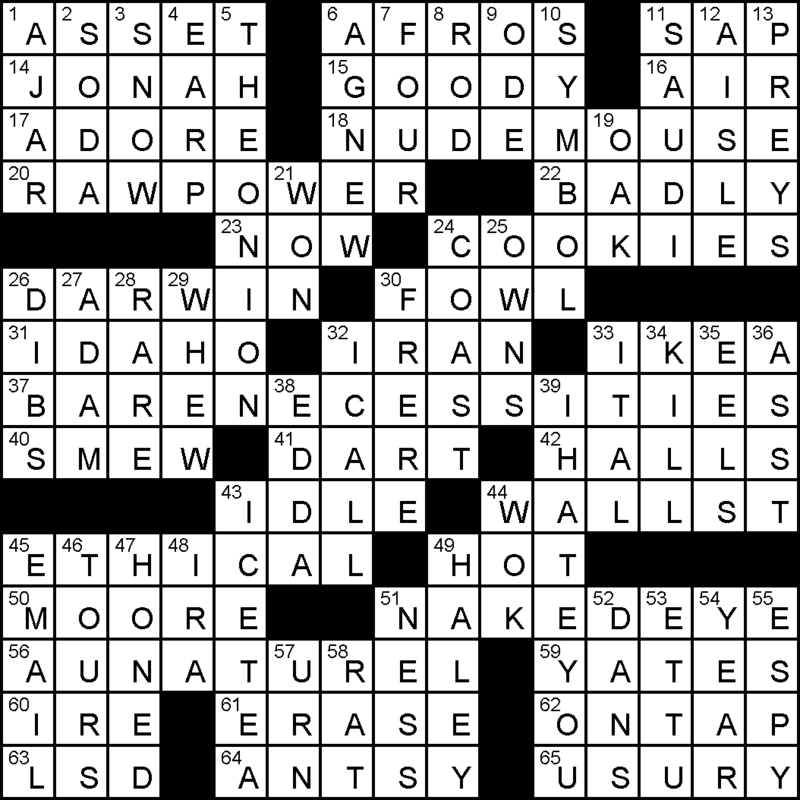 AVCX – Did not like the theme because the answers were completely random phrases. They weren’t humorous; they were just words crammed together because they contained ZIG and ZAG. 27A: A lot of nonsense? was terrible, as was 58A: Crouch in the Gospel Music Hall of Fame. Just too many places where it was impossible to get obscure references from crosses. Maybe I’m being whingy, but I get really frustrated with a puzzle where I have to use the Google to find answers because I’m not up on my Sandberg or Krazy Kat. I thought BENGHAZI GATE PIZZA GIRL was hilarious. MITZI GAYNOR ZAGNUT BAR also. The other two — not as good, . but I wasted enough time in college reading old Krazy Kat comics (and many others) that BUZZ IGNATZ AGAIN at least made me smile (once I remembered the mouse’s name). I thought the crosses saved the day. Early on, I did not expect to solve without Googling, but I only did so at the very end to confirm I had Ms. Ronan’s name correct (since there warn’t not Mr. Happy Pencil to reassure me). I agree with Bryan. Although the ZIG and ZAG idea was fun and original (? ), the four long phrases were just blather. Add in the amount of trivia knowledge required and you have an unpleasant experience trying to solve this. Blather? Or mixing things up to have fun? We could go on and on, but I’m still going to view this as one of the best puzzles of the year. The AVCX was so fun that I was nearly late to work (yesterday). I loved the theme entries, and I always appreciate a Calvin and Hobbes reference. It was so unusual and cleverly crafted. Kudos and thanks , Mr. Walden!